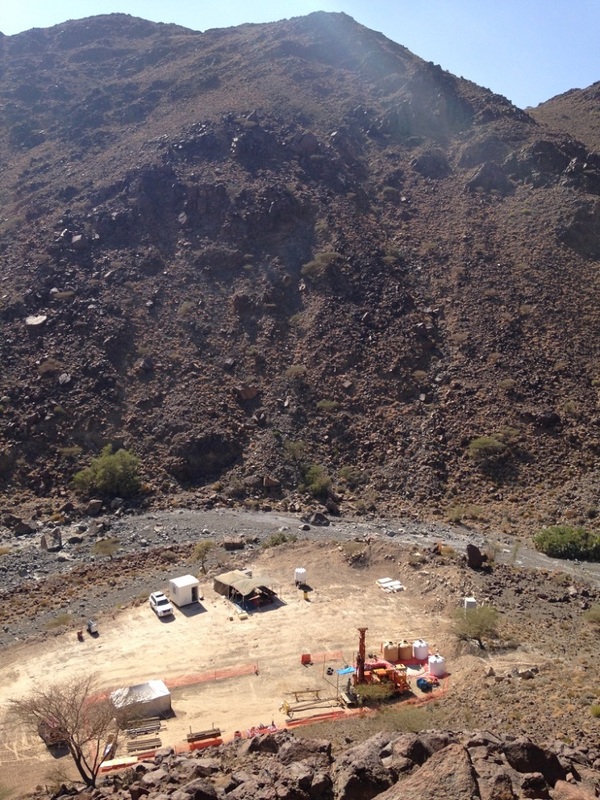 Over two drilling seasons the comprehensive drilling program has sampled the Samail Ophiolite sequence from crust to basal thrust in nine diamond-cored and six rotary-drilled boreholes. The total cumulative drilled length is 5458.15 m, 3221.15 m of which was cored at ~100% recovery. These cores were logged to IODP standards aboard the DV Chikyu during two 60-day description campaigns. 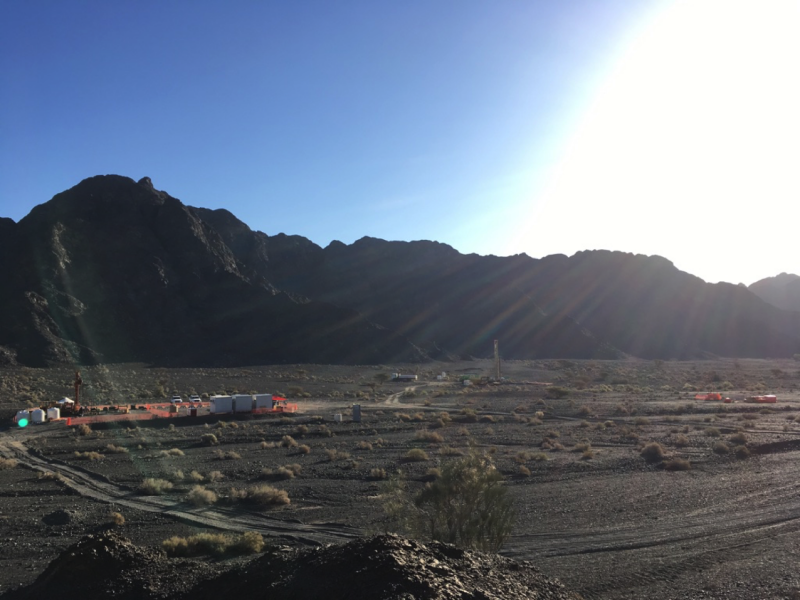 In addition to sampling and analysis of rock core and cuttings, the operations include ongoing geophysical logging, fluid sampling, hydrological measurements and microbiological sampling. Wadi Gideah in the Wadi Tayin massif provides the opportunity to study an intact crustal section. Wadi Gideah drains southward from a divide near the crust-mantle transition. Around the Wadi, the crustal section dips gently to the south, exposing deeper levels upstream, to the north, and shallower levels to the south, culminating with submarine lava flows in the “Ibra syncline”. 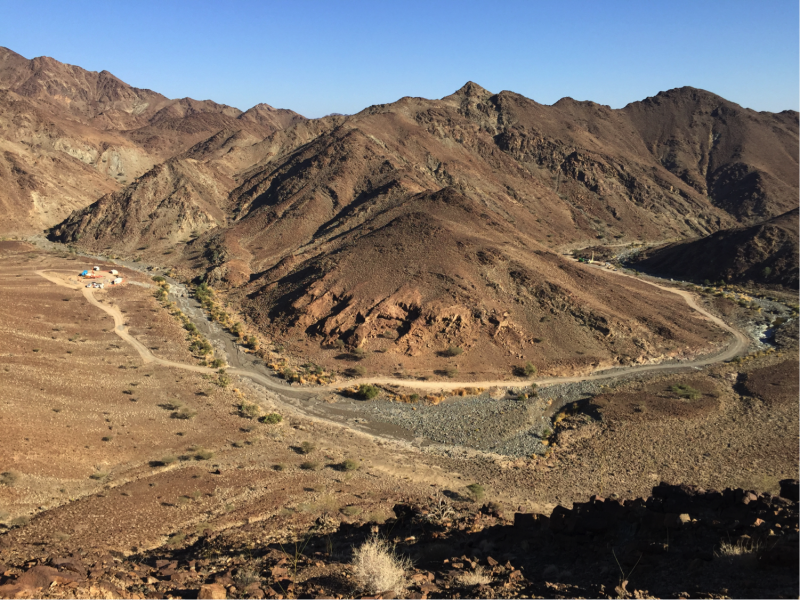 The section is well mapped by different groups, and recently this Wadi has been extensively sampled by OmanDP PIs Koepke, T. Müller, Bähre, Garbe-Schönber, S. Müller and Ildenfonse in order to establish a reference profile through the whole Samail paleocrust, considering petrological, geochemical and structural features, providing the basic framework for the cores drilled at sites, GT1 (lower crust) and GT2 (mid-crust) and GT3 (dike/gabbro transition - drilled in Wadi Abdah). These three 400 m deep, fully cored boreholes were drilled in Phase 1. Operational Objective: To sample intact sections of lower crust, capturing the sheeted dyke - gabbro transition (GT3), middle (foliated) gabbros (GT2) and lower (layered) gabbros (GT1). Scientific Goals: To conduct a detailed, quanititative study of hydrothermal alteration of the oceanic lower crust; To test opposing hypotheses for formation and cooling of the lower crust. 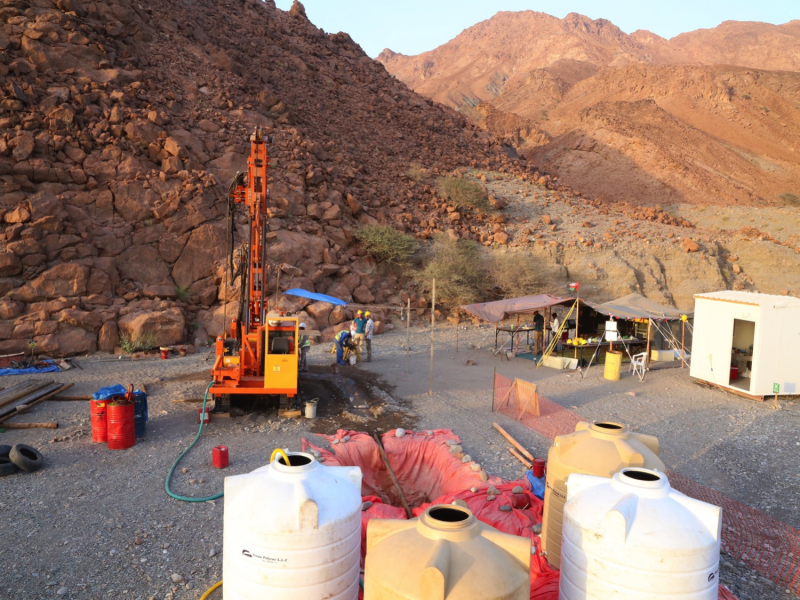 The crust-mantle transition sites were relocated to Wadi Zeeb in Spring 2017 after drilling permits for the original proposed "MD" (Maqsad Diapir) site could not be secured due to restrictions on drilling within the proximity of Falaj motherwells. In Wadi Zeeb the crust-mantle transition is beautifully exposed, with mantle harzburgites in the North transitioning to dunites then gabbros, the latter dipping at approximately 45º to the South. The section was mapped during Phases 1 & 2 by a group led by OmanDP PI Eiichi Takazawa, considering petrological and structural features, in order to produce a cross section that was used to design the CM borehole plan. At CM1 a 400 m deep, fully cored borehole (CM1A), inclined at 60º from horizontal, trending to the N, was drilled at the start of Phase 2, with the aim of sampling the gabbro-dunite transition. Due to geological issues the coring diameter had to be reduced from HQ to NQ at ~ 275m drilled length but drilling continued and ultimately the goal of this first borehole was exceeded when harzburgites were sampled in the lower part of the hole. Simultaneous rotary drilling at CM2 (400 m vertical borehole CM2A) showed that the dunite-harzburgite transition was located at approximately 130 m depth at this site, so the design of the subsequent fully cored borehole there (CM2B) was modified from a 400 m inclined well to a 300 m vertical well. The full depth was achieved without reduction in coring diameter and the reduced length allowed for an additional rotary well to be drilled at CM1 (CM1B), for the purpose of geophysical logging of the upper part of the sequence. 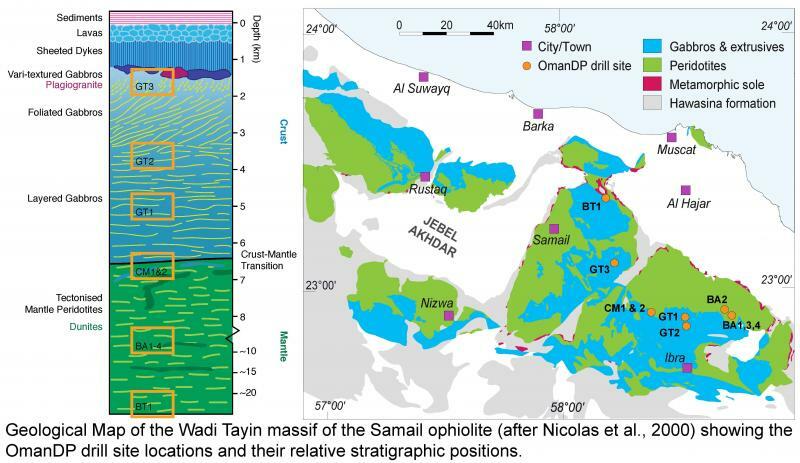 Operational Objectives: To sample the crust-mantle transition of the Samail Ophiolite; To carry out specialised geophysical logging of the crust-mantle transition. Site BT1 is located on the north side of the wide gravel plain of Wadi Mansah (MOD Mountain). Geologically, the drill site is just above the basal thrust of the ophiolite, juxtaposing mantle peridotites in the hanging wall and underlying metasediments and metabasalts of the metamorphic sole and the Hawasina Group sediments. Extensive bands of listvenites (fully carbonated peridotites) occur within partially serpentinized residual mantle peridotites. A 300 m deep, fully cored borehole was drilled in the listvenite, passing through bands of serpentinised mantle, sampling the fault gouge of the basalt thrust and the metabasalts and phyllitic metasediments of the metamorphic sole and the Hawasina Group. Operational Objective: To perform thorough sampling of contacts between listvenite and serpentinised harzburgite, listvenite and the metamorphic sole, and the metamorphic sole and underlying Hawasina sediments. Scientific Goal: To conduct a detailed study of mass transfer from subducting sediments into mantle peridotites.